Melt 1 tablespoon butter in 10-inch nonstick skillet over medium high heat. Add arugula, tomatoes and onion and cook for 1 minute. Remove from skillet and set aside. Wipe skillet clean. Whisk egg whites with pinch of kosher salt and black pepper. Melt remaining butter in skillet over medium heat. Pour in eggs and cook for about 5 seconds. Lift cooked egg up around edges to allow uncooked egg to flow underneath, until omelet is set but top is still moist, about 2 to 3 minutes. 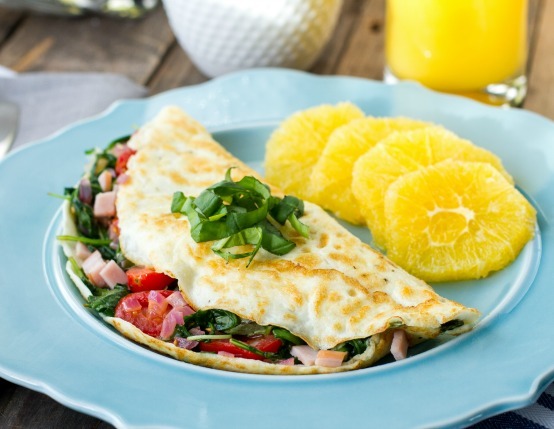 Arrange vegetables, basil and Canadian Bacon on one half of omelet and carefully fold over. Cook for an additional 1 to 2 minutes, or until heated through. Transfer omelet to plate and serve immediately.